A modified azimuthal projection visually similar to stereographic that is conformal. One of an endless possible series of conformal projections using the Driencourt and Laborde algebraic transformations. For use, we must specify the various optional parameters or the result will be no visible display. Scale is true along irregular lines, but the map is usually designed to minimize scale variation throughout a selected region. Low, but continuous distortion within the target region. Profound distortion outside the intended range of the map. Used for maps of continents in the Easter Hemisphere, for the Pacific Ocean and for maps of Alaska and the 50 United States. Provides extremely constant scale over regions as large as the conterminous US. 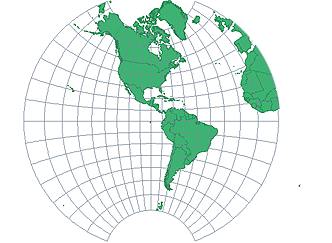 The GS-50 version of this projection minimizes scale errors through all 50 United States including Alaska and Hawaii as well as island possessions. Use only for a single hemisphere. Based on the Driencourt and Laborde complex algegraic series that satisfies the Cauch-Riemann equations that define the conformal transformation of one surface onto another surface. Laborde applied this transformation to the mapping of Madagascar in 1928. Manifold provides a standard set of the most commonly used forms of projections based on Driencourt and Laborde terms.